Improve productivity and customize workflows with the most unique solution for Cloud Computing in Baton Rouge. Everyone in your business does something a little different. But you know this already — with different roles come separate responsibilities and goals. That much is obvious. Because of this, however, business applications and tools aren’t always used in the same manner. In other words, the value of a technology changes from one role to the next. But with the cloud, this is no longer the case. We’ve designed a cloud solution that stands to equally benefit every facet of your organization — from accounting and human resources to customer service and product delivery. Transition to the most unique solution for Cloud Computing in Baton Rouge and improve the way every piece of your company uses technology. With the cloud, your team will receive an all-access pass to the most up-to-date versions of the business applications and tools your company uses. Since parts of your infrastructure are hosted in the cloud, your business will naturally use less energy and require less hardware maintenance. Again, with parts of your infrastructure hosted offsite by a team of IT experts, you can benefit from automatic upgrades and updates. It’s time to adopt a technology solution that has the ability to change your business from the inside-out. Transition to a custom-built Cloud Computing solution and establish a path to greater efficiency throughout your entire business. With the cloud, we can help your business improve productivity, reduce operating costs, increase its competitive edge, and much more. 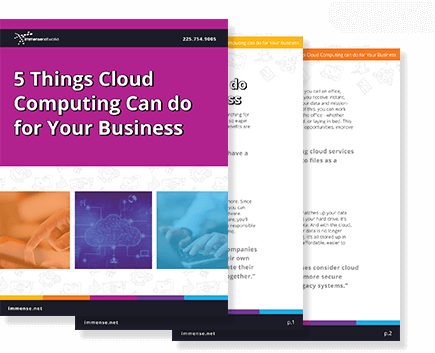 FREE INDUSTRY REPORT: Discover why 85% of enterprises have a multi-cloud strategy.